Welcome to a series on early Canadian environmental history, jointly hosted by Borealia and The Otter ~ La Loutre, the blog of The Network in Canadian History and Environment (NiCHE). This series provides environmental historians of Canada the opportunity to reflect upon the state of so-called “pre-Confederation” history in the field. As was evident from the discussion at a panel on the subject of pre-Confederation Canadian history at the 2015 annual meeting of the Canadian Historical Association, the field has not vanished. It goes by other names and it no longer focuses on the framework of the nation-state. Many historians of Indigenous peoples of North America, for instance, focus on chronologies that pre-date 1867. Historians of the Atlantic World examine aspects of what might have once been called “pre-Confederation Canadian history,” but now fall within a transnational framework. The field of pre-Confederation environmental history is varied and vibrant, as the essays featured in the NiCHE-Borealia collaboration demonstrate. Anya Zilberstein’s contribution, “Jamaican Maroons in Nova Scotia: The Politics of Climate and Race,” will appear on May 18th. It discusses the experiences of the Maroons, ex-slaves who were expelled from Jamaica and migrated to Nova Scotia in the 1790s. Zilbertstein reveals that while certain figures welcomed them – John Wentworth, the colony’s Lieutenant-Governor, felt the Maroons could accelerate Nova Scotia’s sluggish growth – other figures objected to their migration due, in large part, to the belief that peoples of African descent were ill equipped to thrive amid northern environmental circumstances. Appearing on May 20th, Jason Hall’s essay, “The Environmental and Cultural History of the St. John River,” is a distillation of his doctoral dissertation on the relationships among three groups of people – the Maliseet (Wolastoqiyik), the French, and the British – and one of northeastern North America’s principal bodies of water from the mid-sixteenth to the mid-nineteenth century. Among other things, Hall’s essay highlights similarities and differences between the groups’ interactions with the river, and concludes with a heartening message for readers interested in securing its long-term conservation. Colin M. Coates’s essay will appear on May 23rd. Entitled “Who Was the King of the Beasts in New France?,” it examines a “natural history” of New France written in the seventeenth century by the Jesuit priest, Louis Nicolas, and dedicated to Louis XIV. Given the dedication, readers may not be surprised to learn that Nicolas’s work devoted considerable attention to North American species that were thought to possess majestic characteristics. Yet readers might be surprised by at least one of the species that supposedly displayed such traits … although they will need to read Coates’s essay to find out what the species was! Additionally, as Coates shows, the species included in Nicolas’s natural history and the way in which they are described arguably tell us as much about the work’s author and its audience as they do about the species themselves. On May 25th, the series will conclude with a dialogue between all three authors – Zilberstein, Hall, and Coates – who will have the opportunity to reflect on their own and each other’s scholarship, and comment on the varied, vibrant field to which they have contributed. 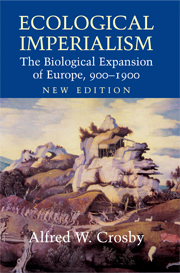 Crosby, Alfred W. Ecological Imperialism: The Biological Expansion of Europe, 900-1900. Cambridge: Cambridge University Press, 1986. Binnema, Theodore. Common and Contested Ground: A Human and Environmental History of the Northwestern Plains. Norman: University of Oklahoma Press, 2001. Spanning an enormous geographic area that straddles what would become the international border between Canada and the United States, this expansive history of the Northwestern Plains traces numerous transformations of this region: environmental, economic, political, diplomatic, technological. Binnema explores the history of the plains looking from the continent outward rather than from the coasts inward. In doing so, he situates Indigenous peoples at the centre of this narrative and shows the ways in which their histories intersected with European colonial expansion, but were not necessarily dominated by the interests of Europeans. 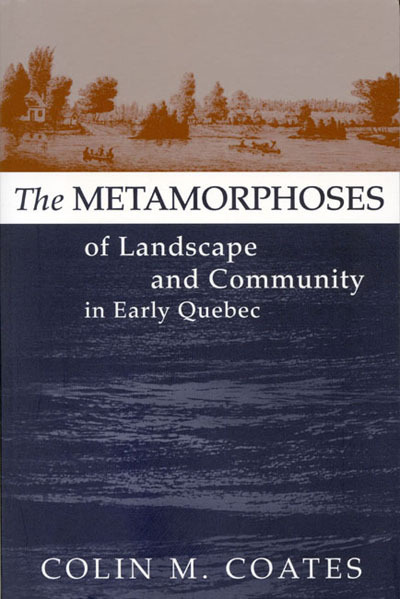 Coates, Colin M. The Metamorphoses of Landscape and Community in Early Quebec. Montreal: McGill-Queen’s University Press, 2000. Much like Jason Hall’s article in this series, Coates’s book traces landscape change over time in a single place as different human communities engaged with the natural environment. In this case, the setting is two seigneuries, one along the Batiscan River and the other along the Sainte-Anne River. The book follows changes in the landscape over the course of changes in human regimes: Aboriginal, French, English. It confronts both material transformations to the environment and the evolution of human perceptions of nature. Hackett, Paul. “A Very Remarkable Sickness”: Epidemics in the Petit Nord, 1670-1846. Winnipeg, MB: University of Manitoba Press, 2002. Forkey, Neil. 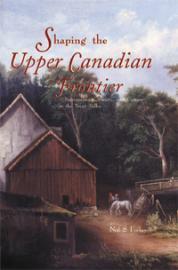 Shaping the Upper Canadian Frontier: Environment, Society, and Culture in the Trent Valley. Calgary: University of Calgary Press, 2003. Trigger, Bruce G. The Children of Aataentsic: A History of the Huron People to 1660. Kingston: McGill-Queen’s University Press, 1976. 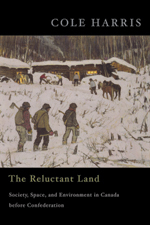 Harris, R. C. The Reluctant Land: Society, Space, and Environment in Canada Before Confederation. Vancouver: UBC Press, 2009. This reading list is, of course, not exhaustive. It is, however, indicative of the breadth of scholarship in early Canadian environmental history. Certainly much of the scholarship in Canadian environmental history focuses on the modern period or “post-Confederation” but there is a strong early modern field and there is much more to be explored. We hope this series shows some of the possibilities. Sean Kheraj is an associate professor of Canadian and environmental history in the Department of History at York University in Toronto, Ontario. He is also director and editor-in-chief of the Network in Canadian History and Environment (NiCHE) where he hosts and produces Nature’s Past: Canadian Environmental History Podcast. Denis McKim teaches Canadian and American history at Douglas College, BC. His research explores the intellectual, political, and religious history of British North America. He is also a founding co-editor, with Keith Grant, of Borealia. Piper, Liza and John Sandlos. “A Broken Frontier: Ecological Imperialism in the Canadian North.” Environmental History 12, no. 4 (2007): 759–95. William Cronon, Changes in the Land: Indians, Colonists, and the Ecology of New England (New York: Hill and Wang, 1983). Kathryn Magee Labelle, Dispersed but not Destroyed: A History of the Seventeenth Century Wendat People (Vancouver: UBC Press, 2013). R. Cole Harris, “The Spaces of Early Canada.” Canadian Historical Review 91, no. 4 (December 2010): 725–59. This is a good idea for a series. Last year, I wrote a piece for active history.ca looking at the decline of Pre-Confederation History (http://activehistory.ca/2015/08/is-pre-confederation-history-actually-declining-a-response-to-thomas-peace-and-robert-englebert/). While preparing the piece, I was struck by how few books or dissertations covered periods both before 1865 and after 1870. This applied as much to environmental, social, cultural and economic historians as to political ones. In the early part of this piece, you proposed a set of alternative periodisations to pre-Confederation/post-Confederation. I expect that most of those would still divide Canadian History into pre ~1870/post ~1870. The division into pre-industrial/industrial eras would periodize around 1870 (which Europeanists refer to as the beginning of the Second Industrial Revolution and Americanists also use as a periodization). A periodization between organic and mineral eras could also lead to 1870 as the break. Meanwhile, one of the largest changes in Canadian economic/environmental history was the expansion of rail and development of global trades in staple commodities, which took off in the early 1870s. Non-Canadian historians also tend to periodize work in ways that see the decade between 1865 and 1875 as central. American historians often periodize their field around 1865 or 1876, while 1870 is common for European historians. Finally, Canada’s railway expansion began in the 1850s, prior to Confederation. Canadian historians have long argued that railway expansion prior to the 1860s precipitated the Confederation debates. The other possible periodizations I listed do not fit with pre- and post-Confederation. For instance “Age of Misasma/Bacteriological Revolution/New Ecology” is drawn from Martin Melosi’s work in The Sanitary City. This is a model for thinking about ideas of sanitation, environment, and health that spans the pre- and post-Confederation period. If we borrow John McNeill’s arguments in Something New Under the Sun, then Canadian environmental historians should eschew Confederation altogether and focus instead on the distinctions between the period before and after 1900. I want to strongly agree with your initial statement concerning environmental histories that span pre- and post-Confederation Canadian history. I did not include those in this list of essential readings, but there are plenty of books in Canadian environmental that span long periods of time. My own book on Stanley Park explores the park’s history from its geological origins to the near present (albeit mainly focused on the modern period). Jennifer Bonnell’s book on the Don River Valley takes a similar approach. James Daschuk’s award-winning book, Clearing the Plains, straddles the pre- and post-Confederation periods with almost half the book devoted to early North American history prior to 1867. Obviously, there are a lot of issues in early Canadian history that are highly relevant to environmental historians of Canada. I hope this series triggers further discussion. An important, useful discussion broke out on Twitter concerning this recommended reading list of early Canadian environmental history. First, I should note that I made the list, not Denis. All the selections were my own. Earlier today, @AdelePerry pointed out the obvious gender imbalance in my selection: all the books were written by men! Why didn’t my list include any women? “Caveats out of the way,” Adele wrote, “I think whenever our answers turn up lists of all-one-kind-of-people, we need to think about the question.” Adele’s intervention, I think, is a call for environmental historians to engage with questions of gender and selection in historiography. This list partially reflects my own bibliographic blinders and partially reflects the field itself. I tried to pick books that I have used most in my teaching and research and those that appear with some frequency in the scholarship. As such, it represents all the gendered filters that have influenced my own education and my own scholarship. It highlights the significance and the politics of citations. It also points to continued issues of low representation of women, Indigenous people, and persons of colour in the environmental history field more generally. Had I expanded the parameters of my view of “early Canadian environmental history,” I might also have included Carolyn Podruchny’s book, Making the Voyageur World on voyageurs in the fur trade. I made reference to Kathryn Labelle’s recent book on the Wendat but instead chose Trigger’s 1976 book. Labelle addresses introduced diseases in her book, but Trigger’s analysis is more comprehensive. Still, that was my choice. I also could have considered Ruth Sandwell’s Contesting Rural Space: Land Policy and Practices of Resettlement on Saltspring Island, 1859-1891 or Béatrice Craig’s Backwoods Consumers and Homespun Capitalists: The Rise of a Market Culture in Eastern Canada. As many of the replies to Adele’s comments suggested, expanding or changing the ways we categorize scholarship can open our view to different work and, perhaps, address categorization that excludes women scholars. The category of “early Canadian environmental history” set geographic restrictions on my view of the field. I included Ecological Imperialism as a global history that incorporates Canada or at least has immediate relevance for the history of northern North America, but I could have included works that do not focus on northern North America at all. Many of the women in the field of early North American environmental history who I use most in my own teaching and research do not write with much focus on northern North America (Carolyn Merchant, Virginia DeJohn Anderson, Elizabeth Fenn, Elinor Melville, and others). Their work is important for understanding developments that would affect Canadian environmental history, and therefore should have been included, but they fell outside my, perhaps, narrow parameters. And there are, of course, many women historians who research and publish in the general field of Canadian environmental history, but with a focus mainly on the period since the late nineteenth century (Tina Adcock, Jennifer Bonnell, Claire Campbell, Keri Cronin, Michèle Dagenais, Joanna Dean, Tina Loo, Liza Piper, Shannon Stunden Bower, and others). With that said, it is also worth highlighting the significant lack of representation of women, people of colour, and Indigenous people in the field of environmental history (in Canada and elsewhere). While such underrepresentation is found, I think, in many subfields of history, it is especially pronounced in environmental history. The American Society of Environmental History has had sub-committees devoted to addressing issues of representation for women and people of colour. This raises much bigger questions about undergraduate training, graduate student recruitment, faculty equity hiring policies, and much more. Victoria Dickenson, “Cartier, Champlain, and the Fruits of the New World: Botanical Exchange in the 16th and 17th Centuries.” Scientia Canadensis 31, no. 1 (2008): 227–47; Spry, Irene. “The Great Transformation: The Disappearance of the Commons in Western Canada.” In Canadian Plains Studies 6: Man and Nature on the Prairies, edited by Richard Allen (Regina: Canadian Plains Research Center, 1976). Adele’s comment about ‘all of a kind’ fits here, especially in terms of whiteness. It may have been said before, but never so frankly and so publicly, especially in the Canadian context, so thank you for saying it. *What the hell is this, anyway? We’re always learning more, and we never have all the answers :).